This current set of One Shot Challenge (OSC) is one the easier side compared to previous incarnations. This is due to both Powercreep of available cards (think Monster Hunter and pairing everything with Diablos ) and easier spawns overall. As such, many players may be completing their first OSC and will now be the proud owner of one of three new cards. Each of these cards has tremendous value and you will be able to acquire all 3 over time through future OSC. Furthermore, there will be limited time Guerrilla dungeons that will allow you to skill them up and farm as many as you are humanly able to. This article will highlight how all three cards can be used and why they are worth pursuing. All three new cards feature majestic artwork along with niche applications that can dramatically enhance your gameplay. Just remember, there will be future Guerrilla dungeons that will allow you to farm each of these drops for skill ups, awakenings, and duplicates. 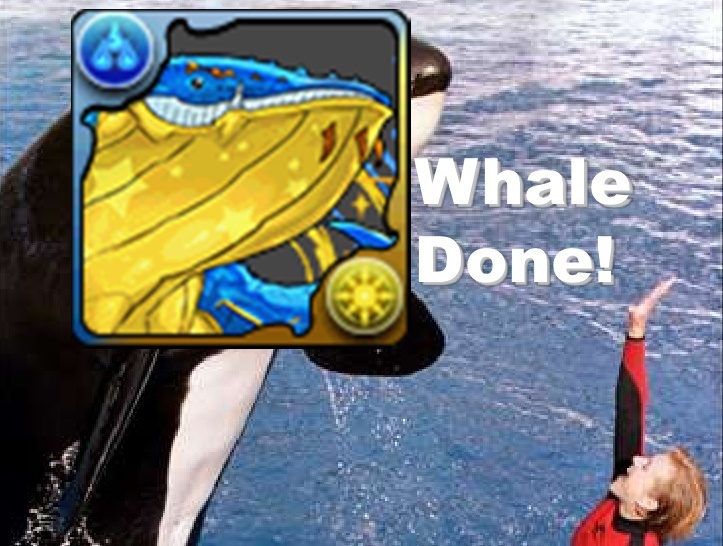 Whaledor is one of the most universally desirable monsters due to having an unprecedented 5 Skill Boosts . While this may seem redundant for coop farming, it is sometimes crucial in order to have key active skills ready in time. By comparison to Tengu , Whaledor has one more Skill Boost and two more turns on their base active’s cooldown. However, once you incorporate 2 Whaledor on your team, you break even for their own potential to carry an inherit, but you have provided a net +2 to Skill Boosts. Whaledor will become crucial to the success of many team builds and will have amazing relevance in future ranking dungeons as you can easily carry a bi-colour board changer. Overall, Whaledor will be one of the most desirable cards to own but will be costly to skill up until his Guerrilla dungeon is released. Also, make sure you always say Whale Done anytime you see him. Raguel is simply the best Skill Bind Resist available as he is able to provide 5 on his own. The closest alternative is the 6-star Heroine Navi , but she is quite rare to acquire by comparison. Despite not owning any other awakening, Raguel will be vital to the success for Liu Bei Farming teams as they naturally have no Skill Bind Resistance. When max skilled, their 5-turn cooldown can be used as an efficient base for Skill Inheritance. Drahklist is not as obviously beneficial compared to his two other cousins as hes kit is less straight forward as he only has wood and fire row awakenings. Drahklist is able to produce a full row of both wood and fire orbs at the top and bottom. While this normally would be useful for button farming against combo shields, the fact that he produces wood negates the value of using Zeus Dios as you will only guarantee 4 combos. Furthermore, you are unable to use him as an assist and must use Drahklist as a sub if you want to capitalize on his kit. As such, he may play a role of a niche fire sub, but retains an interesting leadership role. Being able to provide 100x ATK with 6 connected fire orbs puts him on par with Yamamoto except you are restricted to Dragon types. However, this is not a huge hurdle to overcome and even using a few non-Dragon cards would be okay due to the massive row damage potential. However, one must bring ample Skill Boosts and cards like Yamato will be key to success. New, powerful, and farmable cards are one of the most desirable aspects in Puzzle and Dragons. It helps give meaning to farming/playing through content and I am happy to see NA/EU finally receiving these three exciting cards. Which one are you most eager to acquire and how do you plan on using them? I got Raguel… I don’t do ALB farming, so pretty hard to find a use for him. Looking forward to getting the other two. Great clear, love your play stayle. I likewise got through mine with Anubis/Diablos. Unfortunately I got Drahklist. He will probably languish in my box for quite some time.